Turf toe is a common athletic injury. It is seen at all levels of competition, even among professional athletes. Even though it is not considered a serious injury it can be very debilitating and take a long time to heal. Basically in this condition the great toe is hyperextended (the big toe is excessively bent upwards) thus over stretching the tendon underneath the big toe usually at the level of first metatarsal-phalangeal joint (the joint where the big toe bends). In addition the capsular ligament (a ligament which wraps around a joint to maintain joint integrity) is also over stretched and it too becomes painful. Typically, turf toe is seen in athletes who do a lot of running and quick pivoting such as a running back in football or perhaps a soccer player. It is seen more on hard surfaces like artificial turf and that is actually how it got its name. This is compounded by the type of shoe that they are wearing which is typically a cleated shoe with a very flexible sole. The athlete will be running along, the cleats are “grabbing” the ground and keep the shoe planted to the ground for a fraction of a second longer than a non cleated shoe would. Because the shoe is temporarily “stuck” in the ground but the athletes keeps moving forward, this causes an excessive amount of dorsiflexion at the level of the first metatarsal-phalangeal joint. The fact that the athletic shoe is also very flexible in the forefoot further exacerbates the problem. If the particular step by the athlete also involves pivoting this further aggravates the plantar structures (the soft tissue structures underneath the bone; in this case the tendon and capsular ligament), by grinding the soft tissue further into the hard surface. In some cases this can actually tear the capsular ligament. 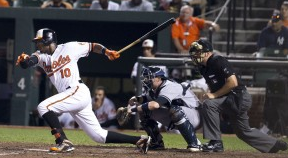 Below is a picture of a baseball player hyper-extending his right forefoot. Some athletes will remember the exact time the injury occurred. In other athletes it may be the result of the cumulative effect of playing a game and they do not really notice it until afterwards. Typically, the patient will complain of pain and swelling in the affected area. There will also be limitation of motion of the great toe. The diagnosis itself is easy enough to make but an xray is helpful to make sure there is no fracture. The sesamoid bones which lie a little bit further back should also be examined to rule out a fractured sesamoid. This condition is classified according to MRI findings. X-rays are not really helpful in this situation as they do not show damage to ligaments and other soft tissue. An x-ray may be helpful, initially, to rule out a fracture particularly of one of the sesamoid bones. Grade 1-irritation of the plantar plate. MRI reveals edema, mild sprain like findings to the plantar plate. Grade 2-partial tear. MRI reveals a partial tear of the plantar plate structure. Grade 3-complete tear. MRI reveals full thickness tear to plantar plate. Cessation of sports activity- Treatment consists of cessation of the sports activity usually for about three to four weeks in a young athlete, possibly longer in an older individual. Physical therapy- can be very helpful in speeding up the recovery period. Anti-inflammatory medication (short term basis) is very helpful. This will help reduce the pain to a manageable level. Taping the big toe to limit the motion of the joint. A podiatrist, athletic trainer or physical therapist should be able to perform this. Rigid shoe- The patient should wear a rigid shoe which will not allow the big toe to over extend. Many times a cushioned arch support is added for additional protection. The problem with turf toe is that it can recur. If you are going to go back to your same sport, on the same surface, in the same athletic shoe, you are almost destined for a recurrence. In my practice I generally try to get a patient into a better athletic shoe, (since I cannot change the sport, nor change the surface). In addition in cases where I feel there is a high propensity for recurrence I will often make a prescription orthotic with a Mortons extension which is a device added to the orthotic to not allow the big toe to overextend. Click here for more information on turf toe and orthotics. In closing it should be noted that turf toe is not limited to the great toe; this condition can happen at the level of the metatarsal-phalangeal joint of the lesser toes as well, although, it is not as common.